NO REFUNDS, RETURNS OR EXCHANGES ON THIS PRODUCT. 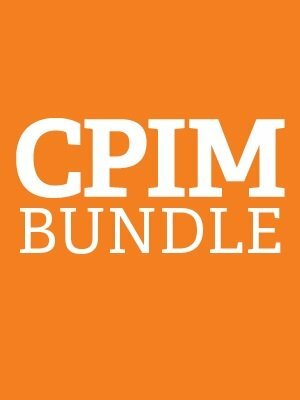 The CPIM bundle is only available to APICS PLUS members, fast-track your CPIM certification and save $200 when you purchase the CPIM Bundle. Not an APICS PLUS member? Join today and save ! To purchase the CPIM Bundle, APICS Core members need to upgrade to an APICS Plus membership. If you are not an APICS member, we recommend that you purchase the CPIM Bundle product for $1900, which includes a one-year Plus membership. This product includes the CPIM Part 1 and Part 2 exams and Part 1 and Part 2 Learning Systems. The CPIM Part 1 and Part 2 exams purchased with this bundle will be provided to you as an exam credit. You will have six months from the time you purchase your CPIM bundle to use your exam credits towards the purchase of your CPIM Part 1 and Part 2 exams. The APICS CPIM Part 1 Learning System is a comprehensive professional development and exam preparation program. It consists of one module, Basics of Supply Chain Management and web-based study tools that reflect the entire APICS Exam Content Manual (ECM). The APICS CPIM Part 2 Learning System is a comprehensive professional development and exam preparation program. It consists of four modules, Strategic Management of Resources, Master Planning of Resources, Detailed Scheduling and Planning and Execution and Control of Operations, and web-based study tools that reflect the entire APICS Exam Content Manual (ECM). The APICS CPIM Learning Systems are available in print and eDownload with online access for one year from date of purchase.